Congratulations—you’re engaged! It’s a stupendous (and hectic) time in your life as you plan your upcoming wedding. You want to look your best for the big day—which means you may be dieting, exercising or making changes to your hairstyle and makeup. Be sure, though, to consider another important part of your appearance—your teeth and gums. 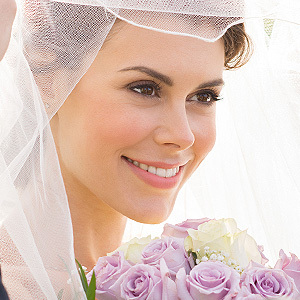 Here are a few options that could help your wedding day smile shine even more. Cleanings and whitening. While dental cleanings are primarily about removing disease-causing plaque and tartar they can also give your teeth that clean and polished look. And if you want an extra boost in brightness, consider whitening—we may be able to lighten up your teeth’s stain-induced dullness. Bonding. If your teeth have slight imperfections—chipping, slight gaps or staining that doesn’t respond well to whitening, consider bonding techniques to repair or cover these defects. Composite resin is a dental material that can be shaped and bonded to teeth to reform a deformed tooth—and with color matching as well. For more extensive defects you can cover the front of imperfect teeth with bonded porcelain veneers or completely cap a tooth with a custom crown. Tooth restorations. If you have missing teeth marring your smile, you have several options. The top choice: dental implants, which replaces the root of the tooth and will be able to have a crown attached to it. An implant can thus restore both better function and appearance. For more affordable options, you can also turn to fixed bridges or removable dentures. The latter can be custom designed to replace all the teeth on a jaw arch or just a few in different locations. Gum enhancements. Teeth aren’t the only part of your smile that might need a helpful touch—your gums’ appearance might also be a problem. There are cosmetic procedures including plastic surgery and tissue grafting that can help correct overly prominent “gummy” smiles or, at the other end of the spectrum, longer appearing teeth because of gum recession. Orthodontics. If you have extended time before the wedding date, we may be able to correct crooked teeth or a poor bite (malocclusion) that’s adversely impacting your smile. In some cases, you may be able to choose clear aligners, removable plastic trays that are hardly noticeable to others, over more visible braces to correct your bite. If you would like more information on cosmetic dentistry for lifetime events, please contact us or schedule an appointment for a consultation.